Overspending by the major NAND suppliers expected to further cool NAND flash prices this year. IC Insights will release its 200+ page Mid-Year Update to the 2018 McClean Report later this month. The Mid-Year Update revises IC Insights’ worldwide economic and IC industry forecasts through 2022 that were originally published in The 2018 McClean Report issued in January of this year. 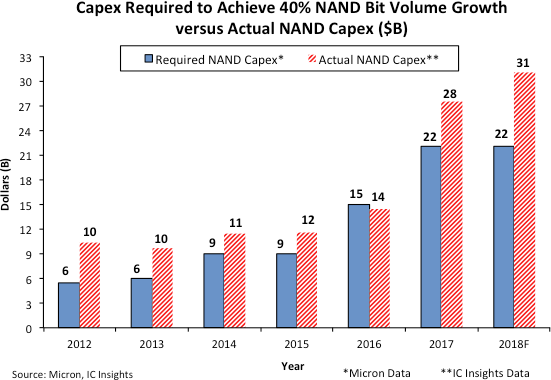 Figure 1 compares the estimated required capex needed to increase NAND flash bit volume shipments 40% per year, sourced from a chart from Micron’s 2018 Analyst and Investor Event in May of this year, versus the annual capex targeting the NAND flash market segment using IC Insights’ data. As shown, Micron believes that the industry capex needed to increase NAND flash bit volume production by 40% more than doubled from $9 billion in 2015 to $22 billion only two years later in 2017! This tremendous surge in required capital was driven by the move to 3D NAND from planar NAND since 3D NAND requires much more fab equipment and additional cleanroom space to process the additional layers of the device as compared to planar NAND. Most of the five major NAND flash suppliers have stated that they believe that NAND bit volume demand growth will average about 40% per year over the next few years. Figure 1 shows that the capex needed to support a 40% increase in NAND bit volume shipments was exceeded by 27% last year and is forecast to exceed the amount needed by another 41% this year (NAND bit volume shipments increased 41% in 2017 but 1H18/1H17 bit volume shipments were up only 30%). As a result, it is no surprise that NAND flash prices have already softened in early 2018. Moreover, the pace of the softening is expected to pick up in the second half of this year and continue into 2019. Historical precedent in the memory market shows that too much spending usually leads to overcapacity and subsequent pricing weakness. With Samsung, SK Hynix, Micron, Intel, Toshiba/Western Digital/SanDisk, and XMC/Yangtze River Storage Technology all planning to significantly ramp up 3D NAND flash capacity over the next couple of years (with additional new Chinese producers possibly entering the market), IC Insights believes that the risk for significantly overshooting 3D NAND flash market demand is very high and growing.